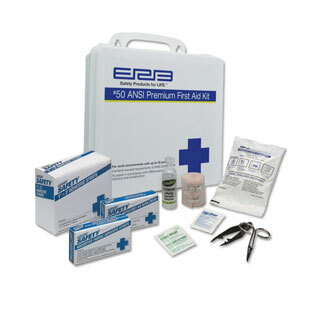 PRODUCT: ERB 50-PERSON FIRST AID KIT IN CASE. 143 PIECES INCLUDING EYEWASH, SCISSORS AND FIRST AID GUIDE. COMPLIES W/ ANSI & OSHA REQUIREMENTS. PRICE/KIT. Complete portable job-site First Aid Kit. 1 Roll, Adhesive Tape, 1/2". 1 Large Wound Pad, 5"x9"
1 Water Jel 2" x 6"